Steve Pikiell watched senior guard Lucas Woodhouse find an opening in the defense and penetrate the paint. It was a play Pikiell ran countless times last season. But this time, he wasn’t calling the play for the Stony Brook men’s basketball team. He was on Rutgers’ bench, now the head coach for the Scarlet Knights, anticipating the outcome of another close Stony Brook home game. Woodhouse dished the ball to an open junior guard U.C. Iroegbu, who was waiting in the corner. Iroegbu took the three-pointer, already having made two from downtown in the game. The ball rolled off of his fingers and looked as if it would find the net. Overtime was looming for both teams. But the ball rattled out. Redshirt freshman forward Akwasi Yeboah fouled Scarlet Knights’ junior guard Mike Williams with three seconds left on the clock, but it was too little too late. Pikiell’s return to Island Federal Credit Union Arena was a success; Rutgers defeated Stony Brook, 71-66. While the Seawolves controlled most of the game, the Scarlet Knights ignited a comeback midway through the second half to take the lead. Guard Nigel Johnson, who had 21 points coming off the bench for Rutgers, led a 13-0 run to give his team a 61-55 lead over Stony Brook. Only three of Rutgers’ points during the run came from outside the paint. Play in the paint was problematic for the Seawolves, as they were out-rebounded 38-27 and only scored 14 points in the key. Junior forward Tyrell Sturdivant struggled against the big-man duo of forward Deshawn Freeman, who had 12 rebounds, and center C.J. Gettys, scoring a season-low four points and grabbing four rebounds. 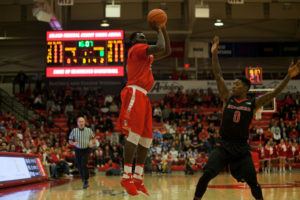 Yeboah and Nyama led the way for Stony Brook, scoring a career-high 18 and 17 points respectively. Both shot 50 percent from three, with Yeboah making four from beyond the arc in total. Woodhouse scored nine points, dished out eight assists and grabbed six boards. The game was close from the start. While Nyama opened up the game with a three, Rutgers responded with a three of its own. Rutgers pulled to a 13-10 lead but, Stony Brook went on a seven-point run, led by Yeboah, to take a 17-13 lead early in the first half. Stony Brook maintained the lead going into the second half. Iroegbu and Woodhouse both made three-point shots to open the period. Sturdivant made a layup to push the lead to 47-37, the Seawolves’ largest lead of the night. But Rutgers was able to fight back to keep the game within single digits. Guard Corey Sanders made a jumper to cut the lead to five, but junior guard Bryan Sekunda made a defensive stop, stuffing Freeman’s layup, and converted a three-pointer to make it an eight-point game. 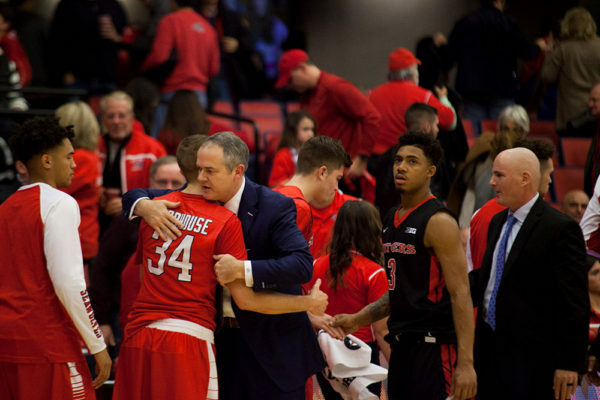 However, Rutgers would go on its 13-0 run and win the game, giving Pikiell one last win in IFCU after leading Stony Brook to the America East Championship last season. With this, Stony Brook goes on the road to take on Hofstra on Dec. 13 at 7 p.m.